Early last year, my wife and were asked if we'd consider attending a time share presentation in exchange for highly discounted lodging at the Newport Coat Villas, a Marriott time share resort in Newport Beach. Sure, why not? I feel like time share presentations get a bad rap. The sales woman showed us around, explained the program they offered, and was very kind when we said it really wasn't for us. It was a really nice place. Just wasn't going to work for us. The three days we were there, is was usually sunny each day. The morning we were leaving, the normal coastal fog finally began to roll in (above) creating what's often known as "June Gloom" along the Southern California coast. For whatever reason, we avoided this - fortunately enjoying sunny weather normally associated with much later in the summer. 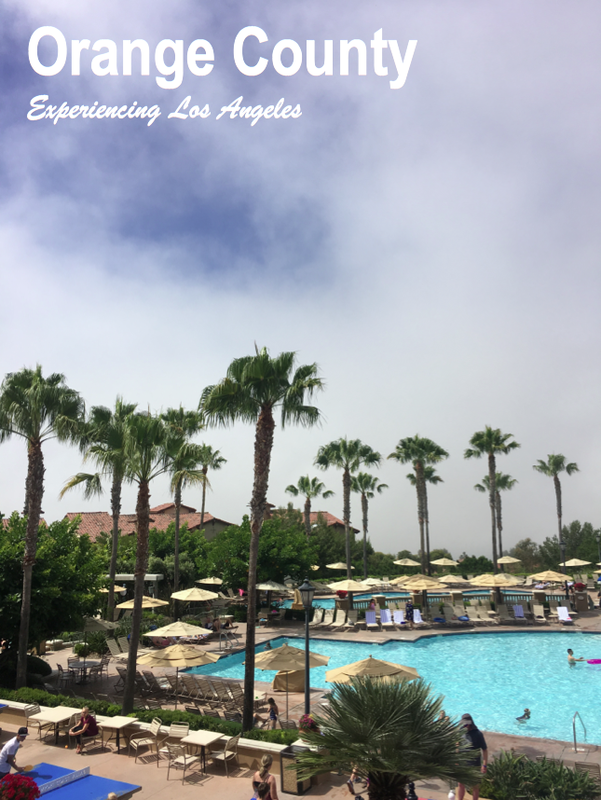 "June Gloom" around the pool. The sun would probably be out later in the afternoon. Final photo before taking off to explore a bit of Orange County. 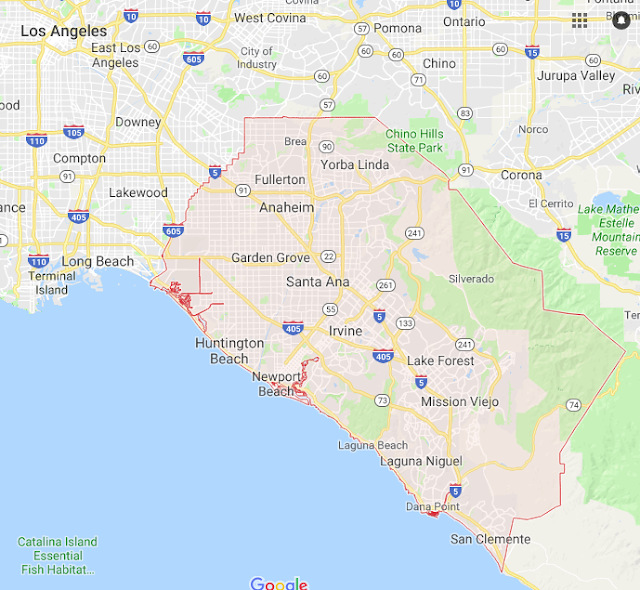 For those of you outside of Southern California, Orange County is a located between Los Angeles and San Diego Counties (as well as San Bernardino and Riverside Counties). While it's considered part of "Greater Los Angeles," Orange County has it's own vibe and feel. Unlike Los Angeles or San Diego, Orange County has no single downtown or center. Orange County consists of 34 different cities, including Anaheim, Santa Ana, Fullerton, Huntington Beach, Newport Beach, and Laguna Beach. 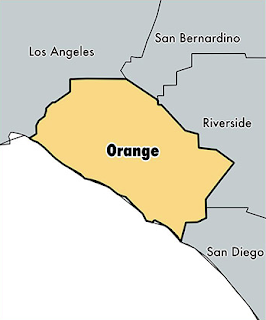 With just over three million people, Orange County has a larger population than 21 US states. And also has a higher population density that Los Angeles County. Perhaps the best way to describe Orange County would be "high density suburban." I was also surprised to learn that it has a higher percentage of Asian-Americans than L.A. County (20% in Orange County vs. 14% in L.A. County). First stop: Cornell Court, my old street next to the University of California, Irvine. I lived on Cornell Court 1991-1994, while working in campus ministry at UC Irvine. At one point in the 1990's UCI's student population was about 65% Asian-American. Not "international students" -- but Americans, mostly from California, who's families were of Asian decent. 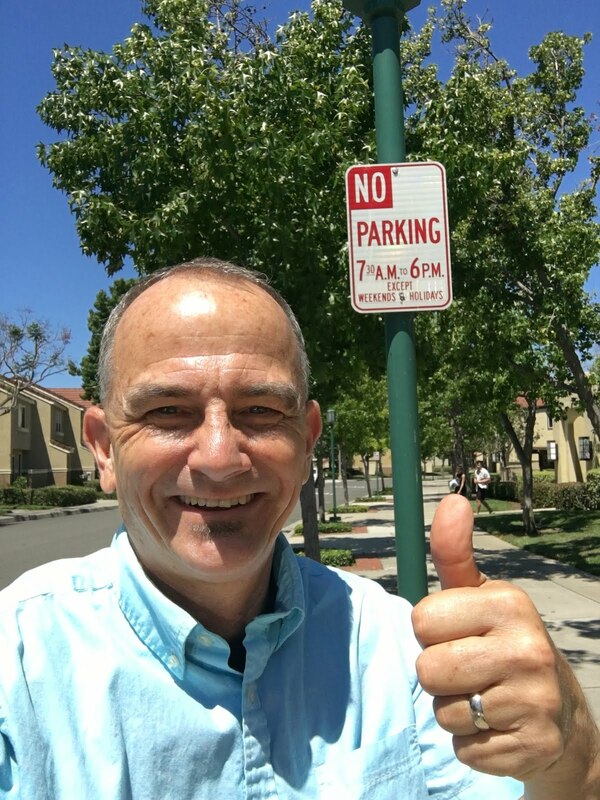 My last year there, I was able to work with the city planning office - finally getting some very needed street parking at night. Guess what? Over twenty years later, my little project is still there. 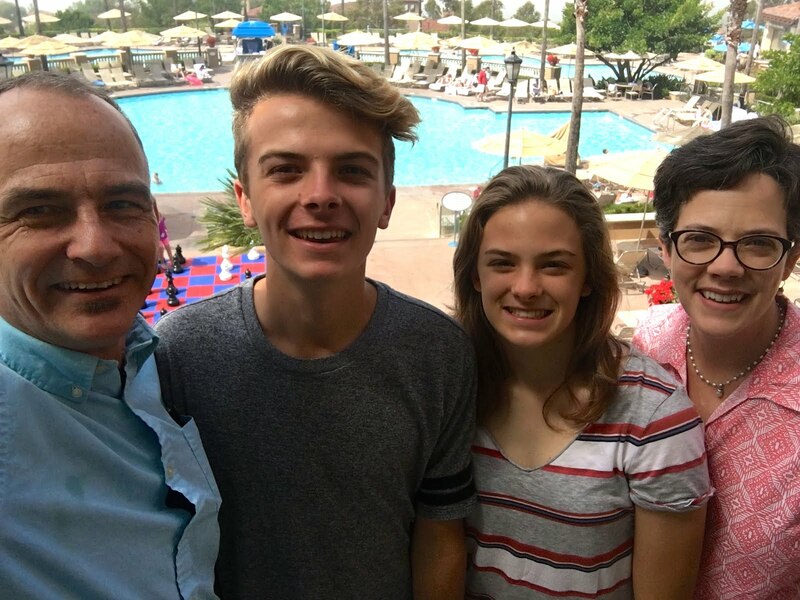 We also drove the campus, just to show our teenage son, 17 at the time, as he was starting to think seriously about colleges. Wide streets, nice cars, office towers, and lots of sunshine. This view out my windshield seems to sum up Orange County. This is on our way to Din Tai Fung, at the South Coast Plaza Mall. 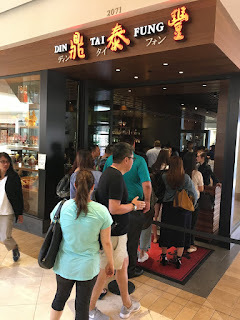 We got to Din Tai Fung before noon - and there was still a wait. This is, without question, the best Chinese restaurant we've ever eaten at. But be prepared to wait. We were at this same restaurant at Americana at Brand a couple years earlier - and waited 2 1/2 hours for a table. I think our wait for lunch this time was more like thirty minutes. While waiting for our table, my teenage kids wandered over to watch the chefs prepare jiaozi (potstickers). My kids expression is so great. They were horrified that I stepped into the kitchen area to get a photo of them watching the prep work. "Dad! What are you doing?!" Food was great - I highly recommend it. Just plan ahead for a possible long wait. 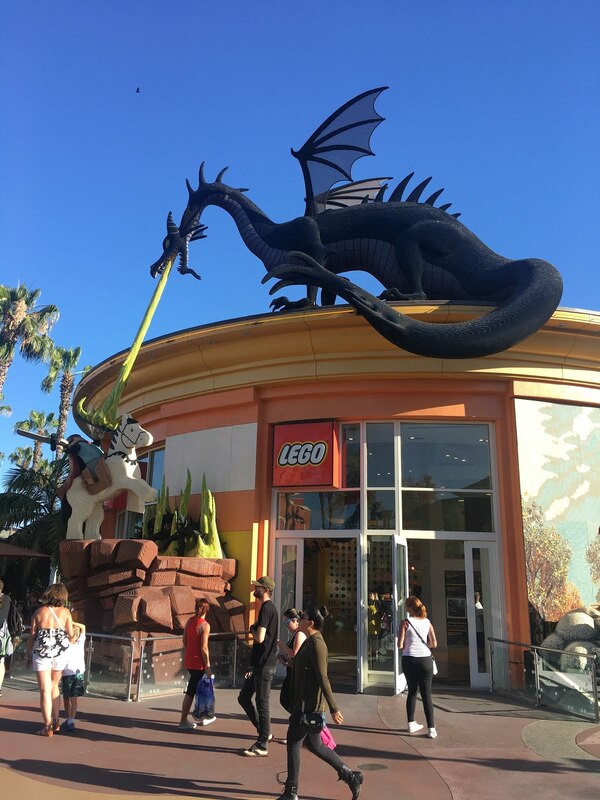 We drove north from South Coast Plaza along Harbor Blvd, through the cities of Costa Mesa, Garden Grove, and into Anaheim. Unlike Walt Disney World, which is a 43 square mile resort complex, the Disneyland Resort is 160 acres - a quarter of a square mile - and is located a couple of miles up on Harbor Blvd. Disneyland's actual street address is 1313 Harbor Blvd. We stayed at the "The Anaheim Hotel" an older complex, literally across the street (Harbor Blvd) from the Disneyland Resort. Above, you can see at bit of the Paradise Pier section located in Disney California Adventure. For what we paid, and knowing we'd be spending the entire day off site and at Disneyland, it was fine. The "supply and demand" side of me actually likes the fact that there numerous reasonably priced hotels within walking distance of Disneyland. Walt Disney World in Florida has it's fans, but I prefer the more manageable, walk-able size of the Disneyland Resort. To the surprise of many, the two parks at the Disneyland Resort actually have more rides than the four combined parks at Disney World. Not shows, or exhibits - but rides. Theres' a total of 57 rides at Disneyland verses just 50 at Walt Disney World. Finally, the weather. California wins hands down on weather. 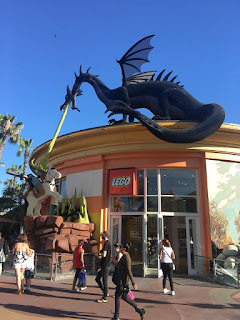 The Lego Store at the "Downtown Disney" shopping complex - basically, a nicely themed outdoor mall. We splurged and saw Cars 3. Mildly entertaining. My kids, especially my daughter, loved it. Inside the lobby of the "Frontierland Tower" at the adjacent Disneyland Hotel is a replica of the original model used in the design of Big Thunder Mountain Railroad. Fun to see on our way back to our motel. We'd be on the real thing the next day. Here's a final image, highlighting several of Orange County's 34 different cities, plus Orange County's location in relationship to downtown Los Angeles.